Sunday had one more excellent day at Gréolières, in fact it turned out to be the best flying day of this trip. After doing some chores in the morning I launched slightly later than usual at around 11:30. By this time there were already some nice little clouds and at least one glider was high up the mountain. The light southerly meteo wind combined with the normal south-east valley wind to create big strong thermals so I quickly reached the summit of the Cheiron. The cloudbase was a bit low still, but I set out towards Coursegoules. At times it seemed better to head out in front of the mountain as the cloudbase was a bit higher there. Just before Coursegoules I turned back as the clouds were a bit too low there. 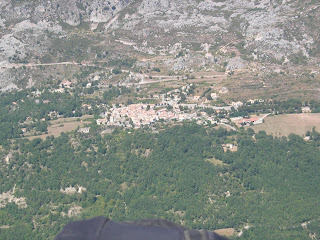 I then tried several times to fly south towards Gourdon, every time getting a bit higher over Cipieres and a bit closer to Gourdon. The cloudbase was rising but the headwind was increasing too. Nevertheless on my last try I could probably have crossed the last ridge before the Gourdon plateau (see track); I was quite much closer than a week ago (cf. track). But as this was my last day I returned to Gréolières (picture) and landed after almost 3 hours of intensive flying to pack up, clean up, and head out to the airport. When I drove out of the village at 17:30 there were still several gliders sky high! For maximum contrast with this excellent week at the Mediterranean the airline offered a rye-bread hamburger with potato salad which set up my stomach, and at Helsinki-Vantaa airport it rained with a cold northerly breeze to boot. Surely made me longing for the next trip!